Roman Pedestal Statue Prop - Dino Rentos Studios, INC. This Roman Pedestal foam sculpture prop is cut in EPS foam then double coated with our exclusive flexible concrete coating. This coating chemically bonds to the foam to stay permenant to the sculpture. Goes great with our Gargoyle statue (as pictured). 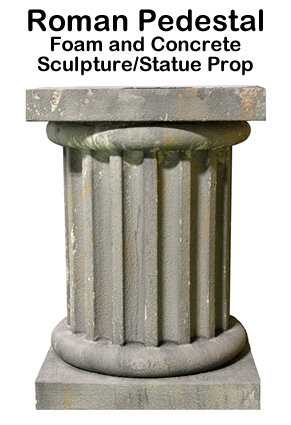 This Roman Pedestal prop measures 28” wide by 28” deep by 30” tall and is shipped to you via freight.